The Level 2 test may have problems involving five types of solids: prisms, pyramids, cylinders, cones, and spheres. Rectangular solids and cubes are special types of prisms. In a rectangular solid, the bases are rectangles, so any pair of opposite sides can be bases. In a cube, the bases are squares, and the altitude is equal in length to the sides of the base. On the Level 2 test, all figures are assumed to be right solids. Formulas for the volumes of regular pyramids, circular cones, and spheres and formulas for the lateral areas of circular cones and spheres are given in the test book. For convenience, formulas for the volumes and lateral areas of all of these figures are summarized below. Using the notation above, the formula for the length of a diagonal of a rectangular solid is , which is derived from two applications of the Pythagorean theorem. 1. The length, width, and height of a right prism are 9, 4, and 2, respectively. What is the length of the longest segment whose endpoints are vertices of the prism? One type of problem that might be found on a Math Level 2 test is to find the volume of the space between two solids, one inscribed in the other. This is solved by finding the difference of volumes. In this type of problem, you are given only some of the necessary dimensions. You must use these dimensions to find the others. 2. A sphere with diameter 10 meters is inscribed in a cube. What is the volume of the space between the sphere and the cube? You need to subtract the volume of the sphere from the volume of the cube. The radius of the sphere is 5 and the volume is . Since the sphere is inscribed in the cube, the side length of the cube is 10 m and its volume is 1000 m3. The volume of the space between them is 476.4 m3. You might be asked to find a dimension of a figure if its volume and surface area are equal. 3. A cylinder has a volume of 500 in3. What is the radius of this cylinder if its altitude equals the diameter of its base? The formula for the volume of a cylinder is V = πr2h . If h = 2r, this formula becomes V = 2πr3. Substitute 500 for V and solve for r to get r = 4.3 in. A third type of problem involves percent changes in the dimensions of a figure. 4. If the volume of a right circular cone is reduced by 15% by reducing its height by 5%, by what percent must the radius of the base be reduced? This equation simplifies to 0.85 = 0.95p2, so p 0.946. Therefore, the radius must be reduced by 5.4%. A solid figure can be obtained by rotating a plane figure about some line in the plane that does not intersect the figure. 1. The figure below shows a right circular cylinder inscribed in a cube with edge of length x . 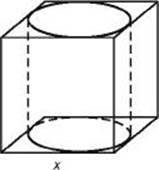 What is the ratio of the volume of the cylinder to the volume of the cube? 2. The volume of a right circular cylinder is the same numerical value as its total surface area. Find the smallest integral value for the radius of the cylinder. (E) This value cannot be determined. 3. The length, width, and height of a rectangular solid are 5 cm, 3 cm, and 7 cm, respectively. What is the length of the longest segment whose endpoints are vertices of the rectangular solid?